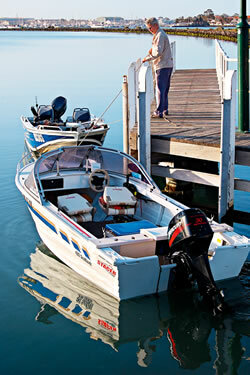 This fishing guide is produced by the Victorian Fisheries Authority (VFA). Please contact the VFA If you wish to make comments about the guide or to obtain further copies. For more information about the VFA, visit the website at www.vfa.vic.gov.au or call the Customer Service Centre on 136 186. Copyright © Victorian Fisheries Authority, 2019. This publication is copyright. No part may be reproduced by any process except in accordance with the provisions of the Copyright Act 1968. All requests and enquiries should be directed to the Victorian Fisheries Authority Customer Service Centre (call 136 186) or email customer.service@vfa.vic.gov.au. This publication may be of assistance to you, but the State of Victoria and its employees do not guarantee that the publication is without flaw of any kind or is wholly appropriate for your particular purposes and therefore disclaims all liability for any error, loss or other consequences which may arise from you relying on any information in this publication. This publication is a guide only, it does not replace the Fisheries Act 1995, the Fisheries Regulations 2008 or other Acts and subordinate legislation applying to, or affecting recreational fishing. This guide summarises the law at the time of publication and cannot be used as a defence in court.